The Madonna of the Streets. 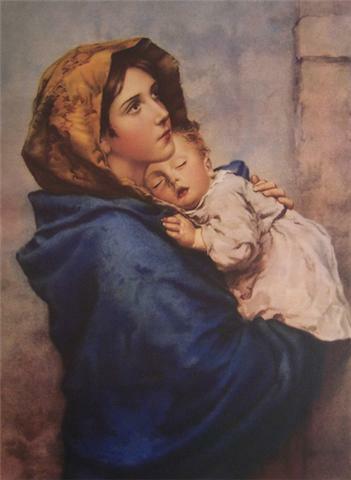 Mary poor and destitute with her infant Jesus. It’s a lovely image. It’s also misleading. What did Mary do with gifts of the Magi; Gold, Frankincense, and Myrrh? They must have been lavished in some quantity after so long a journey. Perhaps Joseph used a part of that wealth to bribe safe passage through Herod’s slaughter of the Innocents, meant to kill Jesus. No doubt some was used to finance the passage to Egypt. More still to sustain them in a foreign land for a few years until it was safe to return home. Mary and Joseph were not left impoverished, destitute. For that to happen, God would have had to break his promise, that all things are possible with Him. It’s worth remembering as we work at crisis pregnancy centers, fundraise for them, support them with our gifts. The same for longer term shelters, such as Chris Bell and Father Groeschel’s Good Counsel Homes, and Covenant House, where I briefly worked with Chris before he set out to found Good Counsel Home. I like the image of the Madonna of the Streets, her peaceful, faith-filled countenance. I’ve come to appreciate, all the more, the Magi who show up daily to fulfill God’s promise to countless other Madonnas of the Streets, enriching their lives and the lives of their babies beyond all measure.